When people hear about the income tax rates they hear about the 15%, 25%, 28% or 33% tax marginal brackets and they confuse marginal brackets with total tax rate. Its a very common misunderstanding to think that you pay the marginal rate on all of your income. Its also common to think that if you move from one bracket to another that this will greatly increase your total tax rate. These are incorrect interpretations of how the tax brackets work. The 2007 tax rate schedules are at the IRS site. The tax brackets are marginal rates. So each % marginal tax bracket only applies to income earned within that bracket. Lets say we're married and we make $50,000. The 10% tax bracket is from $0 to $15,650. Then the 15% tax bracket is from $15,650 to $63,700. No matter how much money we make the first $15,650 of income we have is always taxed at just 10%. 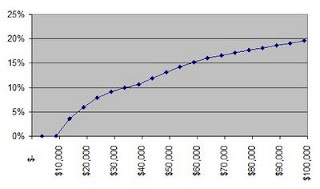 Likewise the next $48,050 we make is always taxed at 15%. If you all the sudden get a giant raise and go from $50,000 to $75,000 this would put your top marginal tax bracket up to the 25% rate. But that 25% marginal rate ONLY applies to the top of your salary, which is the amount over $63,700. The amount below $63,700 is still taxed at the 10% or 15% rates. With $50,000 taxable income you are in the 15% marginal tax bracket, but this does not mean you pay taxes of 15% * $50,000 which would be $7,500. You instead pay $6,712.50 which is about 13.4%. Lets also keep in mind that everyone has a minimum standard deduction and exemption. For a married couple the standard deduction and exemptions for two people would be $10,700 deduction and 2 x $3400 or $6800 in exemptions. Thats $17,500 of income that is tax free for a married couple. So no matter how much you make, as a married couple your first $17,500 would have not a tax burden. I've occasionally heard people think that if they get a raise then pushing them into a higher tax bracket will make them lose money. This is not how the tax brackets work. Say you make $63,000 and are filing married. This puts you at the top of the 15% tax bracket . If you get a $1000 raise then you will now be in the 25% tax bracket. People see this and think "oh no! my tax rate is going up 10% but my raise was only $1000" They assume that 10% higher tax bracket will mean an additional $6400 in total taxes. Thats not how it works. Your tax bracket only applies to each additional dollar you make. Its a marginal rate. The 25% bracket only applies to income over $63,700. Before the $1000 raise your tax bill would be $8,668 and after the $1000 raise your tax bill would be $8848. Thats an extra $180 tax. You'd pay 15% rate on the $700 and then 25% rate on the $300 or .15* 700 + .25 * 300 = 105 + 75 = 180. Your tax bill goes up gradually and the actual tax bill is not a 'stair-step' like the brackets seem to imply. The MoneyChimp site has an examination of tax brackets with a quick tax calculator.